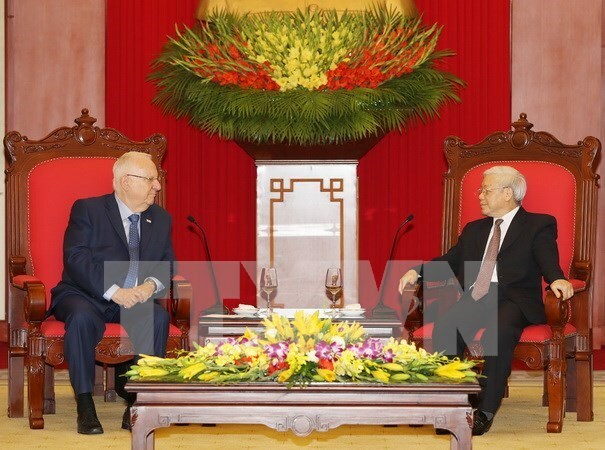 Hanoi (VNA) – Vietnam attaches importance to the friendship and multi-faceted cooperation for peace and development with Israel, said Party General Secretary Nguyen Phu Trong while meeting with Israeli President Reuven Ruvi Rivlin in Hanoi on March 20. The Party leader welcomed the Israeli President’s State visit and noted with satisfaction the sound development of the two countries’ cooperation, particularly in trade, hi-tech agriculture, science-technology, and military technique. He reiterated Vietnam’s foreign policy of independence, self-reliance, peace, cooperation and development, and multilateralisation and diversification of foreign relations on the basis of equality, mutual benefit, and compliance with basic principles of international law. For his part, President Rivlin expressed his admiration for late President Ho Chi Minh and the Vietnamese people who fought heroically for national independence. He spoke highly of Vietnam’s Doi Moi (Reform) achievements and stature in the region and the world, voicing the belief that the country will obtain even greater attainments in the national development and protection under the leadership of the Communist Party of Vietnam. He informed General Secretary Trong about Israel’s situation and the outcomes of his meetings with other Vietnamese leaders.